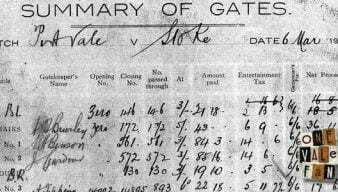 Potteries Derbies are games held between Port Vale FC and Stoke City FC in the city of Stoke-on-Trent. The games have taken place over many years and are fiercely contested. Twelve fans have been given football banning orders after “mass disorder” at the Checkatrade Trophy game between Port Vale and Stoke City this season. 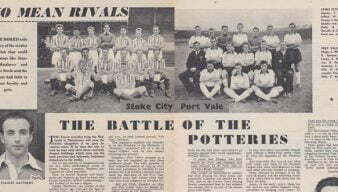 This article from an unknown football magazine circa 1957 is a profile of the rivalry between Port Vale and Stoke City. A cracking Port Vale team move with Talbot supplying Guppy and the winger beating his man to play in Foyle for the goal. Sunday marks the 11th anniversary of the last Potteries Derby – for the record Vale secured a 1-0 win over Stoke thanks to a goal from Micky Cummins – so it seems the ideal time to reprise our Potteries Derbies feature. 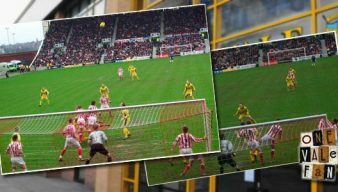 From the first recorded match back in 1882 to the most recent, a 1-0 victory for Vale in 2001, the onevalefan editorial team takes a look back at some of the most memorable Potteries Derby matches.